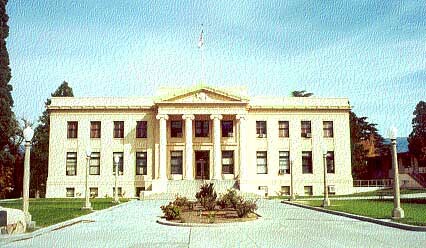 The present Inyo County Courthouse in Independence is the fourth courthouse since the formation of Inyo County on March 22, 1866. The new county operated from rented office space until June 1868, when a contract was awarded to J. J. Mankin to build a courthouse for the sum of $9,832. Completed in 1869, the two-story brick building was destroyed by an earthquake March 26, 1872. The second courthouse, a wood frame two story structure, was completed in 1873 by E. Chaquette at an approximate cost of $15,900. On June 30, 1886 a fire broke out in a vacant building in Independence and destroyed thirty-eight buildings. Although the county records and most of the furniture were saved, the courthouse was one of the buildings destroyed. Once again the Board of Supervisors were required to call for bids on a new courthouse. A contract was awarded to M. E. Gilmore to build the third courthouse for $10,000. The new building was smaller than the previous building and was completed in 1887. The third court house was also a wood frame two story building and was located immediately southwest of the present courthouse. The county offices occupied this building for thirty-four years before it was determined to be too small and was torn down in 1923 after completion of the present courthouse. William R Weeks was selected as the architect for the fourth courthouse. Interesting to note that Mr. Weeks was considered one of the leading architects on the Pacific Coast. By 1915 he had designed more than 1,000 buildings in California including most of the Carnegie Libraries in Northern California and many of the schools built in the state. Other buildings in Inyo County designed by Weeks include: Bishop Union High School, Big Pine School, and the Owens Valley School in Independence (this building has been replaced). A corner stone located on the northeast comer of the new courthouse building bears W. H. Weeks' name as well as the names of the Board of Supervisors in 1922. The casings, doors, trim and paneling of the Superior Court Room are oak. In all, the courthouse is a typical example of design and architecture in the 1920s. The Annex was added to the south of the courthouse in 1965 when more space was required for county offices. The information on this page was obtained from a photocopied document from the Inyo County Recorder's Office ----- No ownership is claimed by this site.